I wanted to do another Shop My Stash post because I just rotated out all of my primers over the weekend, and discovered that I have four different ones from the Elf mineral line chilling out (literally, my house is freezing) in my stash. If you have skin like mine, anything hydrating is super crucial, especially when shopping for primers. Primers can also be tricky for me because my skin is a little sensitive, and many break my skin out. However, I have never experienced that with any of the Elf mineral primers. These are $6 each, and they come in pretty durable bottles with a pump. I love that these primers have pumps, it just feels way more sanitary to me, honestly. There are quite a few primers in this line, so I think everyone can find something they would enjoy. 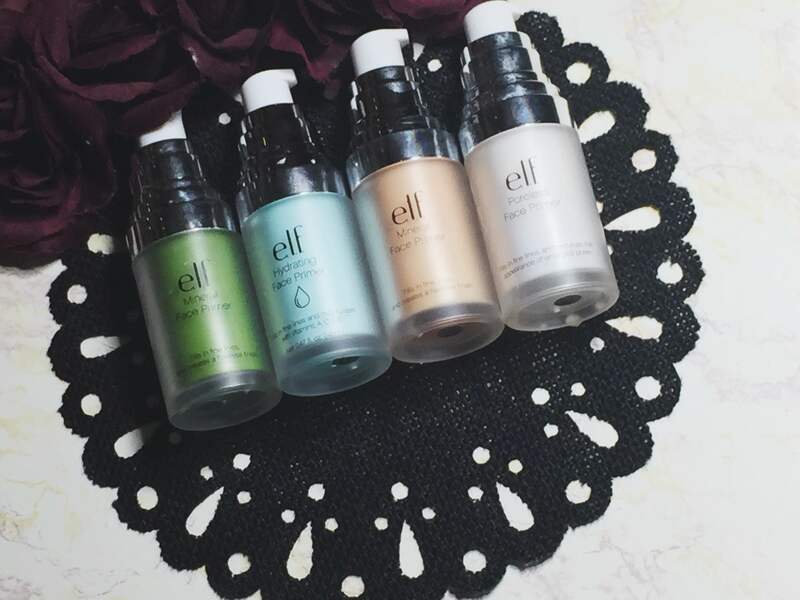 Elf is actually sold in a few drugstores now including Target, Walmart, and most recently CVS! Green Correcting Mineral Primer- I have gone through about 3 bottles of just this primer since I discovered these. I love this primer, and I honestly need to pink it back up and use it again. Green primers correct red tones in the face, and that is something that I need given my Irish genes. Hydrating Mineral Primer- This is a newer addition to the mineral primer line, and I have enjoyed it so far! It doesn’t feel like a lotion primer like the Laura Mercier one that I use, but it does leave my skin feeling hydrated and very smooth. I tend to mix half a pump of this with the green correcting primer somedays if my skin is looking a little irritated. Radiating Primer- This is another newer addition, and I actually mentioned it in my Top Elf Favorites video awhile back. It has a really nice champagne tint to it, so it makes me look like I’m glowing from the inside out! Even in Fall, I typically wear an illuminating primer with full coverage foundations. My skin type just won’t allow for matte makeup unless I’m going for that caked on look…which I don’t want to go for that look any time soon. Poreless Mineral Primer- This is the very first one I ever tried, and this is also my second bottle of this. I normally can’t wear poreless primers because they have so much silicone that it breaks me out, but this one never has. I usually put this on my nose and around it because that’s the only places where my pores are a bit larger, but I highly recommend this primer! So, those are the four that I own and that I will be adding back into my makeup rotation this Fall. For $6 each, I think these are incredible primers. I love the bottles they come in, and I feel they look very cute sitting on vanities. The bottles look heavy, but they feel light, and I have never personally had any trouble from the pumps or felt that the packaging is flawed. If you have any of these, what do you think about them? Let me know! I really hope you all enjoyed this short and sweet little Shop My Stash post! If you have anything that you would want to see me talk about or revisit, please let me know! I hope you’re all having wonderful days! OOO these sound awesome!! When e.l.f. has another 50% off sale, I am totally picking these up!! Thanks for the review love!